New York utilities think electric cars are a good way to engage with their customers. 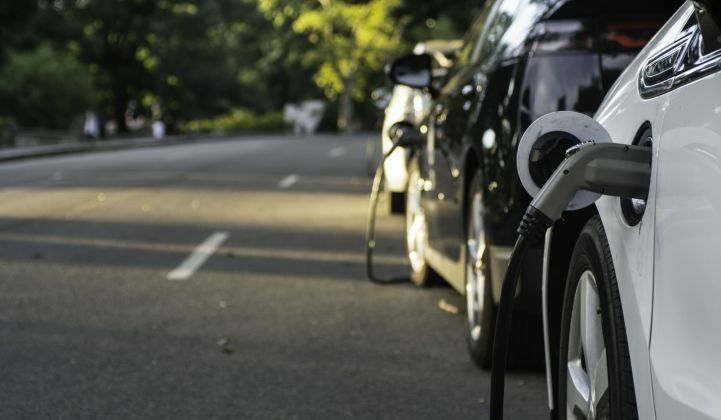 New York utility Consolidated Edison this week launched an online marketplace to make it easier for customers to purchase electric cars. That follows a June decision by National Grid to add electric vehicles to its own online marketplace. As utilities stare down a future of flat or declining electricity consumption, electric vehicles offer a glimmer of hope. If customers suddenly need to buy electricity to fuel their cars, that means new load for utilities to fulfill, plus charging infrastructure and distribution upgrades that need to be built. (New York utilities don't earn money on the volume of electricity sold, but do on capital investments to deliver it). Hence Con Ed’s new creation: Cars.coned.com. The new addition compares electric cars to their cheaper gasoline-powered foils in a way that compares lifecycle costs. Looking for a sweet SUV for cruising to the mall? Sure, it’s 2018 after all. But doesn’t a Tesla Model X cost $14,000 more than a beefy Lincoln Navigator? 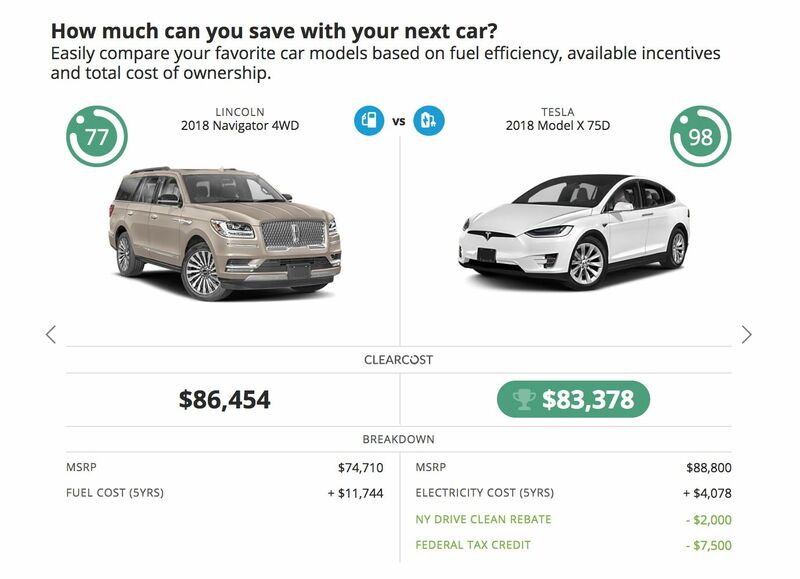 Yes, factor in the cost of five years of gasoline versus five years of electric charging, and subtract the NY Drive Clean Rebate and the federal tax credit (while it lasts), and voila: the more-expensive EV is actually cheaper to own. Energy retailers have demonstrated an eagerness to use their customer relationship to cross-sell clean energy items. That rationale pushed several companies to jump into rooftop solar, until they failed to make money and abandoned the effort. So many are turning to marketplaces. Con Ed and National Grid have outsourced the work to Enervee, a Los Angeles company that invokes “data-science, behavioral science and digital marketing” to help utilities guide their customers to purchase efficient appliances. It has been active in New York and California, but also set up an appliance marketplace for AEP Ohio earlier this year. The firm really does have a knack for efficiency: It delivered two identical car comparison websites with different utility logos slapped on the top. The same service could be coming soon to additional energy providers. It’s a new twist on an existing trend: the online utility-backed marketplace. These marketplaces started largely as a way to improve rebate applications, notes Fei Wang, a senior grid edge analyst at GTM Research. If you live in New York and buy an efficient LED lightbulb for $7, you might not realize that Con Ed offers a $4 rebate on that very item. Or filling out the paperwork for a $4 check might be too much of a hassle. The marketplace applies the rebate automatically at the point of purchase. Rebates, however, will not last forever. More EV marketplaces may soon spring up, Wang added, particularly among utilities that already work with Enervee and have EV infrastructure programs underway. It’s not clear what success would mean for this endeavor, or how it would even be measured (“increased customer understanding”?). The service does not actually sell cars; it simply reiterates publicly available information about them. Still, it’s easy enough to fire up a clone of the service if some other company wants to slap their logo on it. One day soon, even more Americans could look to their utility for advice on whether to buy more electricity.